So your SSD seems to have been installed as BIOS legacy mode. Now your new MB has issues with it. I’d say the fastest way to solve this problem is to reinstall Antergos. And as you have a new MB, it surely supports UEFI, so reinstall it in UEFI mode. Before doing anything, make sure to backup your personal data to an external drive or USB stick! Another thing is the SSD partition table format. I guess the partition table on the SSD is msdos, not gpt. For UEFI install, the gpt partition table is recommended. You may change your disk to gpt in gparted. But note: that operation deletes all files from the disk. If you still wish to dual boot with Windows, install Windows first, then Antergos. Copy those files to the external drive, along with the backups. Those files can be used as a reference for installing the same packages to the newly installed system. Hopefully I can import those files back into pacman to automatically install everything missing. I am not at home for the weekend and will continue to resolve this issue on Sunday evening/Monday. I wish you all a good relaxing weekend and thank you very much for the enormous help! Little update from my part. I did pacman -Qet > /tmp/explicit.txt as well to get those packages that I installed manually and checked those for configs outside of /home/.config to copy to my external hdd. Now my backup is done and I am going to format the ssd and will check if I need to change gpt as well. 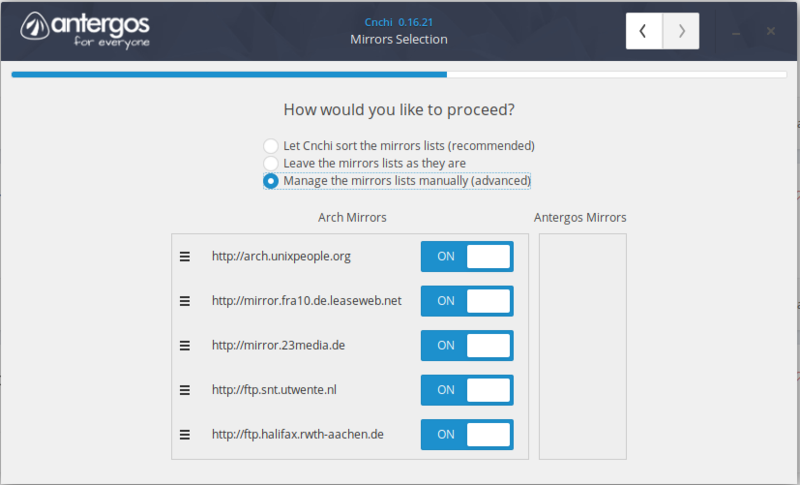 Hopefully this time I can install arch/antergos via UEFI (since last year this did create a lot of issues along the way). Edit 6: I was able to install (or at least start the install procedure) for KDE. Let’s see if it keeps going till it’s finished. Hopefully I can install gnome additionally and switch to that later. Great to hear it is working now! You really have had lots of issues, but you managed to solve them with great determination! Way to go!